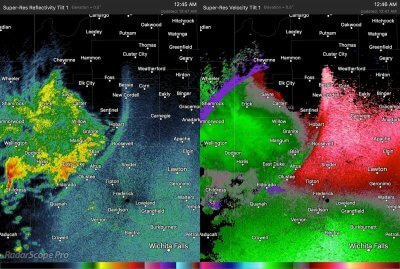 Home » Weather » Educational Topics in Meteorology » Check out some of the fascinating things Doppler weather radar can detect! The National Weather Service’s Weather Surveillance Radar-1988 Doppler (WSR-88D) network across the United States consists of 155 Doppler radar sites operated by the National Oceanic and Atmospheric Administration (NOAA). 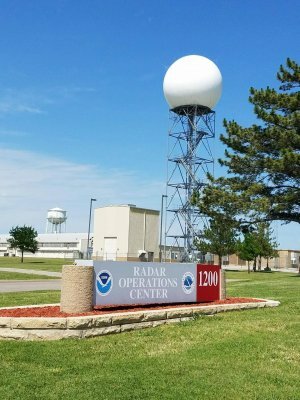 In 2013, the entire WSR-88D network was upgraded to dual-polarization capabilities, meaning that the Doppler radar can emit pulses in both the horizontal and vertical plane. The use of the polarimetric radar variables has been a crucial element in weather forecasting operations, research, and in public consumption. Doppler weather radars rotate about their axis, and are Planned Position Indicators (PPIs). Since the implementation of polarimetric radar, Doppler radars work by emitting pulses in both the horizontal and vertical plane. These emitted pulses travel at the speed of light and when they pass through an object such as a raindrop, a portion of the beam returns to the radar due to scattering. This portion of the beam that returns to the radar is captured through the receiver (which is also the same antenna that emitted the signal). After a multitude of complex processes within the radar, it is displayed into the imagery that we see on a daily basis. 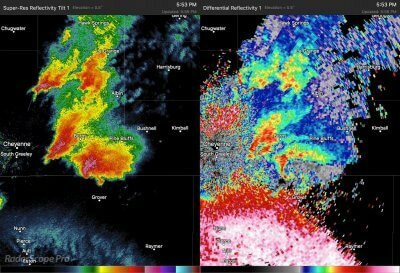 Dual-polarimetric variables such as the Differential Reflectivity (ZDR), Correlation Coefficient (ρHV; or CC), and the Specific Differential Phase (KDP/ϕDP) must be utilized to obtain a full analysis of the types of echoes involved on the Ze imagery. While we will not delve into the specifics behind these polarimetric radar variables, the images including polarimetric radar will be shown in a relevant manner. 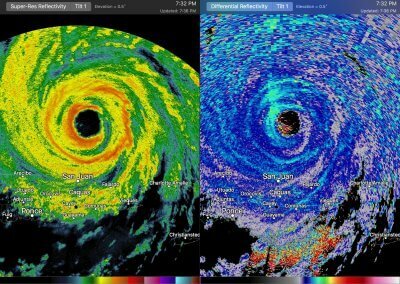 Now that we have established some basic understanding of the functionality behind a WSR-88D, we can dive into some fascinating and unique imagery that has occurred over the past several years. The above image is a PPI scan from the Equivalent Reflectivity Factor (Ze). This is the most universal weather radar product used by meteorologists and the public alike. The higher the echoes, measured in decibels (dBZ), the greater the intensity of precipitation. However, the exact precipitation features (i.e. rain vs. hail) cannot be discerned through the sole use of Ze. 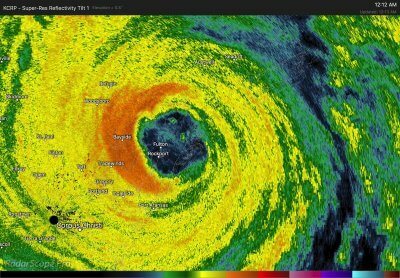 On the Ze image above, concentric ring-like bands of heavy precipitation are seen with an intense band within the western eye-wall. On the ZDR, small raindrops are evident by low ZDR (darker blue pixels), while larger, convective drops are evident in the western eye-wall evident by higher values of ZDR. The red pixels within the eye are birds, as birds are large relative to the emitted wavelength and thus result in high values of ZDR as well. Further south (bottom of the ZDR image), higher values are seen as well. This is likely due to sea spray produced by large waves, but continues to be debated among radar meteorologists. This MCS produced a wind gust of 104mph in Omaha, Nebraska, before crossing into northern Kansas. 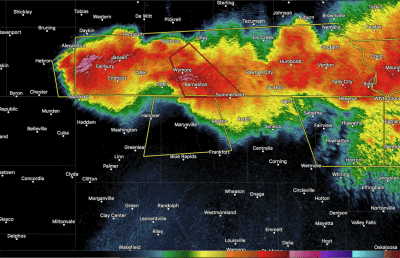 Areas of high dBZ near Fairbury, Kansas, indicated a mixture of both large hail and heavy rain (high dBZ does not always represent giant hail). These supercells have the classic “hook” structure, indicating the presence of a mesocyclone (note: a hook echo does not have to occur for a mesocyclone to be present). On the ZDR imagery, ZDR arcs are evident. ZDR arcs indicate a veering (clockwise turning) storm-relative wind profile and that the size sorting of hydrometeors such as rain and hail is occurring within the storm’s updraft. This is due to the cyclonic (counterclockwise) rotation of the updraft that can suspend and distribute precipitation accordingly, depending on the orientation of its shape and size. Further south of the supercells, the anomalously high ZDR is due to biota such as bugs being lofted from the thunderstorm outflow. This undulation was observed as one shallow wave by the Oklahoma Mesonet network data, and resulted in a strong wind shift as it moved across the area a. 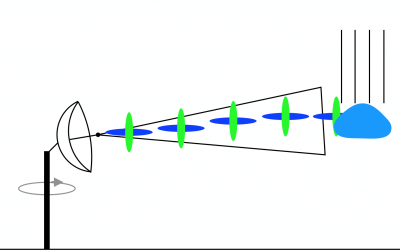 The left image is the Ze, and the right image is the Doppler Velocity (Vr). On the Vr, the green pixels indicate the wind blowing towards the radar site, while the red pixels indicate the wind blowing away from the radar site. 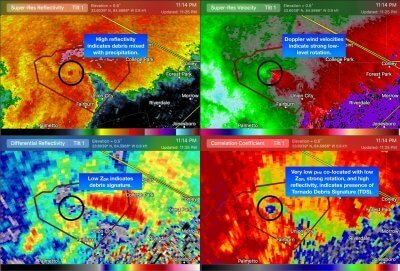 A Tornado Debris Signature (TDS) southeast of Atlanta, Georgia, on March 19th, 2018. 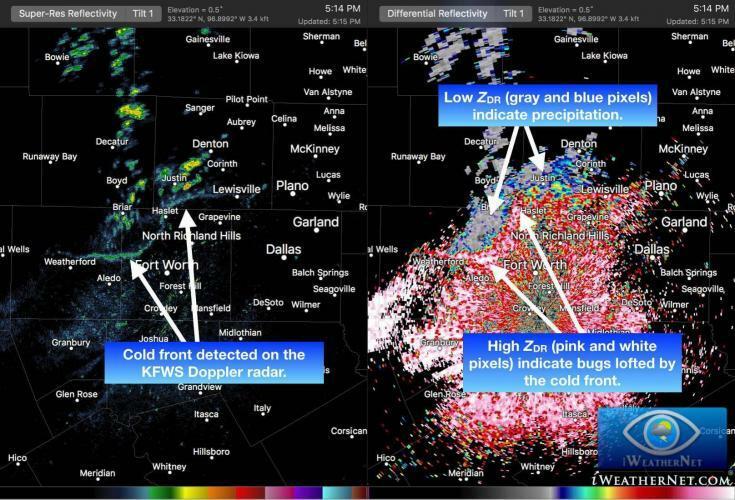 In mid-October 2018, the Dallas-Fort Worth Doppler radar detected insects caught within an area of convergence along a cold front approaching the area. Below is a two-panel image of the radar data. The left image is the standard base reflectivity, and the cold front can be seen by the pixels taking on a linear orientation. 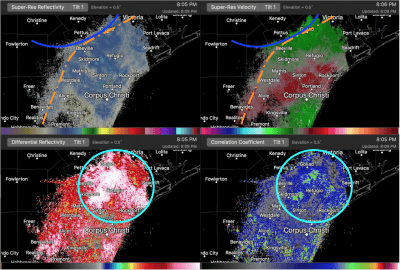 The right image is the differential reflectivity (ZDR), and it can distinguish the difference between the insects (white and pink pixels) being lofted by the front and the rain (gray and blue pixels) that is occurring behind the front. Insects collected in the area of convergence along a cold front. The above video shows bats taking off for their nightly feeding, detected by the KFDX Doppler radar at Laughlin Air Force Base. The bats will sometimes fly very far distances before returning home around sunrise. You will notice a concentric ring-like pattern, as the bats take off in all directions and encounter the radar’s beam at a given altitude. This can also be seen with other biota, including birds and bugs. Below is a video that reveals a retreating dryline in the evening hours in southwestern Texas. What does the radar imagery look like with a cold front, sea breeze, and birds all in one scan? Here is a quad-panel image from February 1st, 2018, from the KCRP Doppler radar in Corpus Christi, Texas. A cold front was approaching from the northwest, a sea breeze was evident along the coastline of the Gulf of Mexico, and birds were flocking for their migration. Tagged Doppler Radar, Polarimetric Radar.